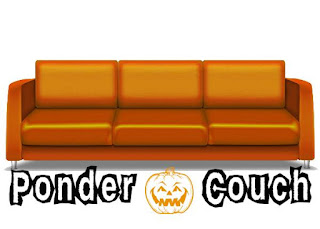 From the Ponder Couch: IT'S HALLOWE'EN SEASON!!!!! Look at that beautiful header that Geoff made! Let's add some new stuff to those old videos I just posted! Look at my new tattoo! I got it last month! It's sort of 2 tattoos. 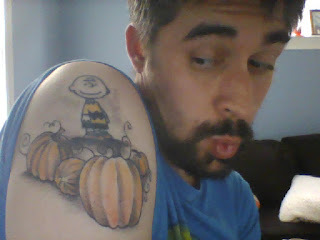 I already had Charlie Brown, but the pumpkins were added around him, and he got colored in. So it's basically one big tattoo instead of a tattoo I already had surrounded by a new tattoo. It was really hard to take that picture with my webcam. Old/New, Boy/Girl, Cartoon/Real, Filmation/"Real". It's all good. I found out from Dinosaur Dracula several weeks ago that Wayback Burgers had some Ghostbuster promo food because of the new Ghostbusters movie coming out on bluray. After a googlemapsing I found that there was one a couple hours away! Princess Melawesome agreed to go with me and found it! It's in a mall food court! I got all 3 items and they were all pretty good! My favorite part was the shake! The burger had Ghost Pepper sauce on it, and there was Ghost Pepper sauce for dipping the Mac n Cheese bites. The Ghost Pepper sauce tasted great, but was a bit too hot for me to finish. I just checked the Wayback Burgers site and it looks like they're still available! Go get some! That's all the new Hallowe'en Goodness I have for you so far! Well, except for this picture I took of myself in the Trader Joe's bathroom because it was October 1st, I was wearing one of my Jack-o-lantern shirts, my hair looked amazing, and I felt cute. 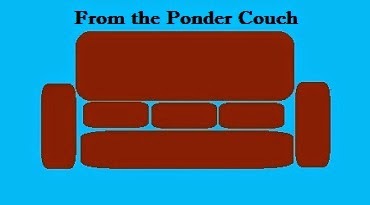 More to come as soon as I get it made or find it! PS: I read awhile back on Neil Gaiman's tumblr that Halloween is acutally "Hallowe'en"! I like that better. So I'm going to start writing it that way when I remember to! Rejected by the New Yorker 4 and 5! My Favorite Yard Haunt 2016! Pez, Ecto Cooler, and Bill and Ted! Rejected by the New Yorker 3! Old Mother Goose - a Spooky Nursery Rhyme!